"I’m innocent, man. I love you all. 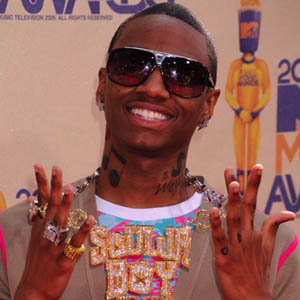 I just want you’ll to know I’m innocent," says rapper Soulja Boy to his fans. Soulja Boy has maintained his innocence after being arrested for alleged possession of drugs and weapons. The 21-year-old rapper—whose real name is DeAndre Cortez Way—was arrested yesterday (October 18) after police in Temple, Georgia, found drugs and weapons in a car he was riding in along with four other people—but he has now been released from custody after posting a $10,000 bail. Speaking to a group of fans, CBS Atlanta quoted the "Crank That" hitmaker as saying: "I’m innocent, man. I love you all. I just want you’ll to know I’m innocent." Police officers also reportedly confiscated his puppy when he was arrested, but the pooch has now been returned following his release. The hip-hop star has since taken to Twitter to thank his 3.1 million followers on the social networking site. He tweeted: "thank you and i’m sorry. love you forever, seeing your letters and you standing outside that jail made me feel the love. my fans r the best. "aye can I have a real n***a moment? my fans was DEEP AS F**K OUTSIDE THAT JAIL MAN IM SORRY!!! thats love!!!!!!!!!!!!!!! (sic)." He also wrote messages to promote his new film, Soulja Boy: The Movie, which was released on the same day he was arrested.